I’ve been living right at the point where the Root Glacier merges into the Kennicott Glacier, in Wrangell – St. Elias National Park (Alaska), since mid May. I’ve been exploring and photographing this massive glacier and its moraines for a while. Walking on a glacier is a special experience, kind of like walking on another planet! The ice crystals shine from all directions. 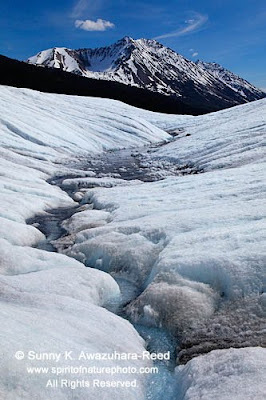 The melting water creates narrow streams, as they find a way out toward the glacial surface. There are numerous waterfalls on the glacier. The pools reflect some of the most beautiful colors on earth. 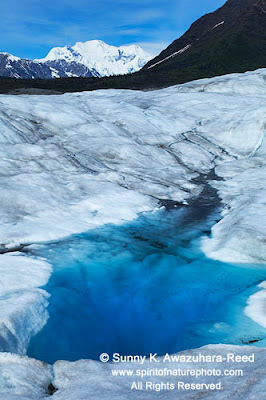 I love to find the aquamarine blue colored pools on the glacier. This peak is Mt. Blackburn and its highest point is 16,390 ft. When it’s clear out, I can see this white peak from my window. My favorite view is that of Mt. Blackburn, as it rises high above the glaciers. 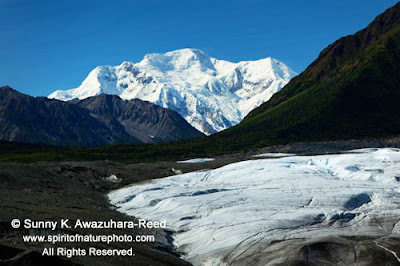 Greetings from Wrangell – St. Elias National Park, Alaska! I’ve been living, exploring, and photographing in this pristine Alaskan wilderness since mid-May. 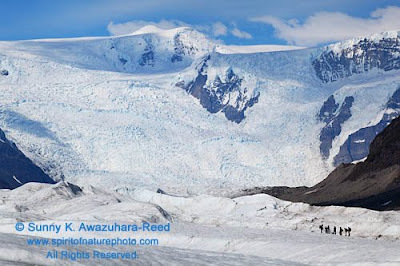 I’m amazed by the massive glacier, the high mountain ranges, and the wildlife in this area. Finally, I am able to access the online and update my news. I’ll post some articles from my notes with new images since I arrived here. Here is a note from the day when I first arrived at this park. After a whole day of driving, I finally arrived to Wrangell – St. Elias National Park, my home for four months. 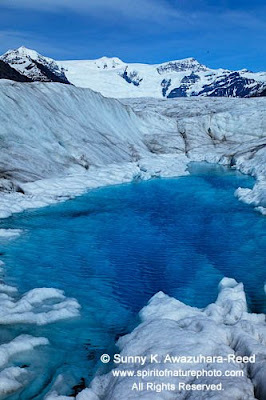 Wrangell – St. Elias National Park is the largest National Park in North America, six times as large as Yellowstone Park. However, this park is minimally developed for tourism (at least not yet…). Most of the parts of the park still remain wilderness. 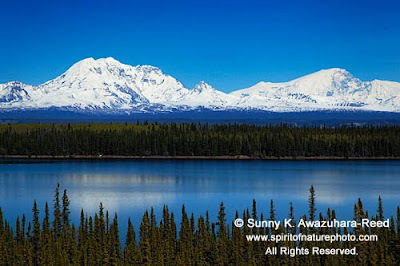 The park includes ten of the fifteen highest peaks in North America, with four major mountain ranges- Wrangell, St. Elias, Chugach and Alaska- and the largest glacier system. I saw total of six moose around the area! 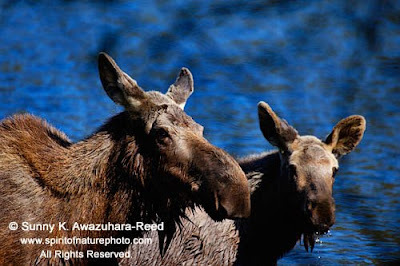 This is a mom and her young teenage moose near Chitina. Leaving the last of civilization, the small town of Chitina, we followed the dirt McCarthy Road sixty miles deep into the park. I arrived at the historic mining town, Kennicott, in the evening. The two glaciers, Kennicott Glacier and Root Glacier, stretch out in my backyard. This beautiful backcountry will be my home for the summer. 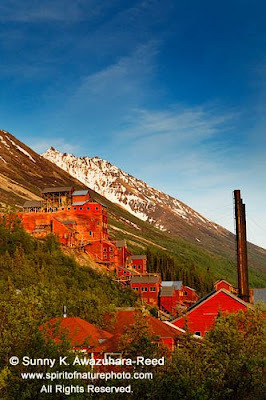 These are the old buildings of the historic Kennecott Copper Mine Mills. Please visit my blog again. Thank you for stopping by.